Cosmic Fortune is one of the stranger-looking Net Entertainment Video Slots we’ve seen, and it bears a kind of cross-resemblance to another of their games, Elements, while combining a robotic-look and feel to it. The design verges on tacky – almost bad – but somehow, like they normally do, Net Entertainment manage to pull it all off spectacularly, and Cosmic Fortune ends up being a great slot game, that many players around the world choose to play, thanks to its large payouts, flexible staking options, and progressive jackpot. The game itself is built using 5 reels, and uses 3 rows and 15 pay lines to deliver a relatively standard Net Entertainment Video Slot layout. The design and backdrop of the slot looks to be an outer-space, gassy environment, and all the game’s symbols and functional buttons are designed with this in mind; the reel symbols are large, metallic-looking, and take up a lot more space than most slot games. Thankfully you won’t see any of the low-paying playing card symbols, with Net Entertainment opting to use game-specific symbols instead, including an Asteroid, a Moon, a Spaceship, a Pink Monster, Two Different Characters, and the Star of the game, the Gold-Goggle-Wearing Monster. You’ll also see a wild symbol and a scatter symbol, represented by a Golden “W”, and a “S” on a Blue Sphere, respectively. Cosmic Fortune offers players a wide selection of exciting gameplay, but the bonus-round and free-spins is where the action (and usually money) is to be found. Much like some of Net Entertainment’s most popular slots (like Gonzo’s Quest), Cosmic Fortune uses a Cascading Reels structure to offer a base-game feature; each time you make a winning combination, the symbols that make up the win disappear, with all symbols dropping down a notch. New symbols drop into place to fill the empty spots, and this is basically a “mini-free-spin”, which continues until a win is no longer made. A name that’s suspiciously similar to Gonzo’s Quest, once again (OK, the games are basically identical in terms of gameplay and feature), the Free Falls bonus is triggered when you land three or more of the scatter symbols anywhere in view. Do so, and you’ll be awarded with ten free-spins. 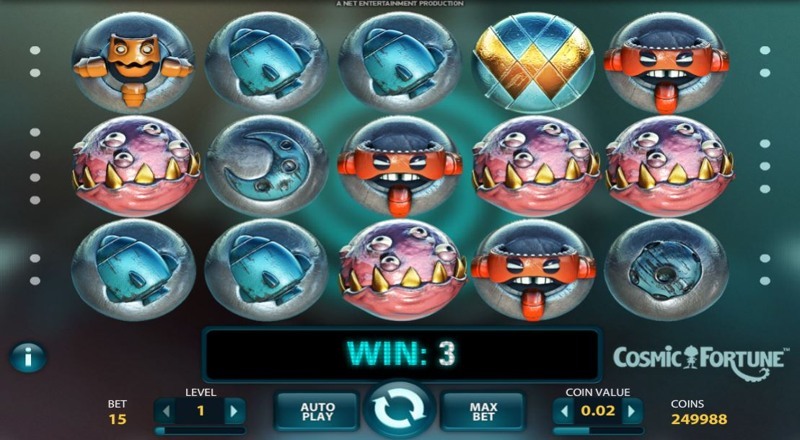 During the free-spins, each time you make a winning pay line, the number of symbols that make up the win will be counted, and at the bottom of your screen, you’ll see that this number is totalled up. Once you finish playing out the free-spins, the number at the bottom of your screen will then translate into marbles, which are dropped onto your screen; this includes coin wins, as well as the chance to enter the progressive jackpot game. When your marbles are dropping onto the screen, if you’re lucky enough to land three marbles in the “Jackpot Cup”, you’ll enter the progressive jackpot bonus-round, where you’ll then see 50 jackpot-only marbles drop. 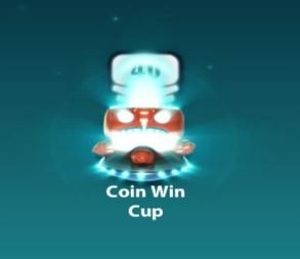 This time, you have five cups, including Mega, Major, Midi, Mini, and Rapid, and if you can land three marbles in one cup, you’ll win the corresponding jackpot. It sounds a little strange, but it’s super-simple to pick up, and just go and check out the game for yourself to see how simple it really is.